What are you wearing to the reunion? This charming, classic dress pattern features pintucked pleats at the front and back, a choice of button tab or ruffle embellishment at the front, and a sweet neckline. Gently gathered short sleeves, our signature hem facing with topstitched detail, and buttons up the back complete the look. The dress can also be shortened into a blouse. 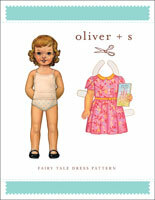 Share your photos on Instagram with the hashtags #familyreuniondress and #oliverands. Girl's dress pattern. This dress features pintucked pleats at the front and back, a choice of button tab or ruffle embellishment at the front, and a sweet neckline. Gently gathered short sleeves, our signature hem facing with topstitched detail, and buttons up the back complete the look. The dress can also be shortened into a blouse. After successfully sewing this pattern, you will have developed the following skills: buttonholes, external facing, flat-set sleeves, pin tucks, and plackets. Light- to medium-weight woven fabrics like quilting cotton, voile, lawn, shirting, poplin, broadcloth, and linen. Coordinating thread, lightweight fusible interfacing, 5/8" buttons or snaps for back closure (five for View A sizes 6M–2T, six for View A sizes 3T–4, seven for View A sizes 5-12, four for all sizes View B), four 1/4–3/8" decorative buttons for View A. Chest 20 1/2" 21 1/2" 22 1/4" 23 1/4" 24 1/4" 25 1/4"
Sleeve length* 3 1/4" 3 1/2" 3 3/4" 4" 4 1/2" 4 1/2"
Length, View A** 16 3/4" 17 3/4" 19 3/4" 20 1/4" 21 1/2" 22 1/2"
Length, View B** 12 1/4" 13 1/4" 14" 14 3/4" 15 3/4" 16 1/2"
Chest 26" 27" 28 1/4" 29 1/4" 30 3/4" 31 1/2"
Sleeve length* 4 3/4" 5" 5 1/4" 5 1/2" 5 1/2" 5 3/4"
Length, View A** 24 1/4" 25 3/4" 27 1/4" 29" 30 1/2" 32"
Length, View B** 17 1/4" 18 1/4" 19" 20" 20 3/4" 21 3/4"
This is the first Oliver + S pattern I've made, and it did not disappoint !! The pattern was very professional, the finishing techniques wonderful, the dress sewed up beautifully, and my daughter gets so many compliments on her beautiful new dress. Thank you!!! I made the 3t and 4t sizes. The neck was too big for my liking so i raised it an inch in the front and the back and 1/2 at shoulder seams. I made 2 3t dresses and one 4t with the raised neck after my original dress. The pattern is very well done and directions are very easy to follow. I would definitely buy more patterns. The dress itself in completion is beautiful! Thanks for supplying simple but elegant patterns! I saw this dress made up on someone's blog, and just loved it. I tracked down the pattern and made one size 2T immediately, and am in the process of making another identical one size 6 so that my granddaughters will have "sister dresses". The pattern downloaded easily and was simple to put together. The directions were detailed and easy to follow, and the pieces went together perfectly. Will definitely buy another pattern. They are a bit pricier than most pdf patterns I have bought, but sometimes you get what you pay for! I absolutely adore this pattern. It's got just the right Sweetness to it! Have printed the pattern and read the instructions. Seems very self explanatory. Can't wait to find some fabric and get started! Oliver & S writes such great patterns! So easy to understand. The dress turned out so cute! I made a 6-12 month size for an 18 month petite little girl. Fit perfect! I made this in a size 6-12 months for my 11 month old daughter. The neckline is a little wide on the shoulders but otherwise it fits great and it looks darling. The pattern was accurate and easy to follow. I plan on making another for my three year old as well! I have sewn this dress only once so far but I intend on sewing it many times. The little pleats and button detail are so cute and fitting for this dress. I liked the instructions for finishing the collar facing, hem and placket. It results in a nicely finished inside. 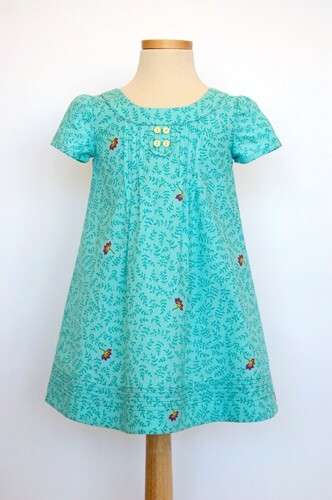 I love this classic girls dress pattern, I think its perfect... I often change little bits & pieces in patterns to make them a little different or special, but the Reunion Dress doesn't need any changes its perfect. I love this pattern! I have sewn 3 or 4 in different sizes, have ideas for several more on my Pinterest board! I love the pintucks so much. And the yoke leaves lots of room for embellishment. This pattern is really fun to sew. I made two of these at the same time. Easy to follow instructions, the sizing seems to be on the small side - the size 34 months is a snug fit on my baby grand daughter but I haven't yet tried the size 4 on my other granddaughterr. I liked the finished garment, a classic for sure. I'm a beginner sewer, but this was totally do-able with the explanations that came with the pattern. 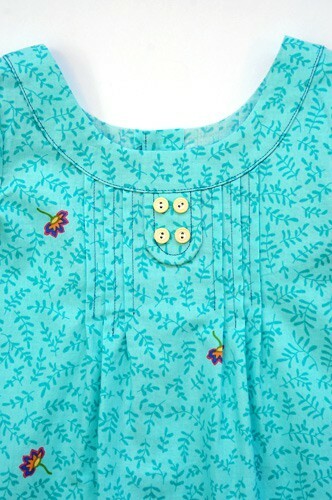 I learned a lot and ended up with a dress and a blouse that I really like for my daughter. I didn't include the center front detail in either (just personal preference), but otherwise followed the pattern exactly. A lot of fun! I made this dress in a size 12 for my granddaughter and it came together very nicely. I chose a busy pattern for the fabric so transferring the markings for the tucks was impossible. So getting the tucks just right was a bit challenging. I really loved the pattern for the family reunion dress. I think it was very clever i could print in on a A0 scale. I'm from Belgium, and we use other technics (for example, on the pattern, there is never a seam included), so sometimes that was a bit confusing (i should have red the instructions better, because it was explained). My daughter is 4 years old, but her measurements were those of a 2 year old. Maybe that's also different in Belgium; But I'm happy, that means i can use the pattern for a few years longer. I had a little bit of difficulty with the collar, but i made it work. the dress looks really nice! it was well done pattern and a pleasure to use. The biggest problem was not your fault. My printer didn't reproduce accurately. The 1" grid printed at 15/16". I was not able to reprint, so went with larger size wich was not exactly the correct measurement, but I was able to adjust. Next time, I will be more careful. This was the first dress making I had done in over 10 years. I will definitely continue. This pattern was very easy to follow and enjoyable once I figured out how to print. I didn't see the option to send the last page of the file to a printer and have them print on one large sheet until I had already used a lot of my own pages and time. Not all of the lines on the pattern match up exactly, so I did a little fudging - everything turned out totally fine in the end. I had a very sweet dress to gift and the whole process took about a day. Loved this dress in Liberty Print! You have excellent styles and great instructions! Can't get lost with your measurements and details. I made the Family Reunion dress for my 14 month old granddaughter. She wears 18 mo in ready to wear so I made her 12-18 mo size. It is unfortunately a little big for her but it turned out just like the photos. I am fairly experienced in clothing construction but some things were new to me. I especially liked the hem facing. I plan on making this dress many more times. 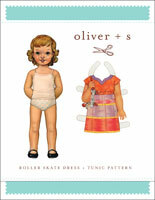 I have since purchased a few more Oliver&S paper patterns. I much prefer them to digital patterns. This is a lovely dress to make with options of customising it by doing contrast details such as the neck piece, sleeves and bottom of dress. I had a bit of trouble understanding how to attach the hemline and ended up doing my own thing. You need some sewing experience to be able to make this. Perfect for a walk or a wedding! I adored sewing this little dress. I made a CW Park Ramble cotton for play http://www.flickr.com/photos/motherof5/6162207103/in/set-72157627704619988 I did find it a generous fit width wise so I made the chest size and added length. I was very honoured to have my silk version featured on the O+S blog. http://oliverands.com/blog/2012/03/customized-family-reunion-dress.html The more formal fabric sewed up beautifully and showed off the pin tucks to perfection. 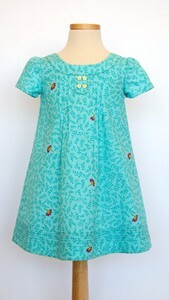 For the lovers of heirloom sewing this dress lends itself perfectly to a seam free inside finish. I made this dress for an OS O+S friends daughter http://www.flickr.com/photos/motherof5/6897237822/in/set-72157627704619988 I used french seams and bound the armholes with a scrap of Liberty. Sewing this dress is such a pleasure as all the details are so elegant but quite easily achieved. Bravo oliver+s. 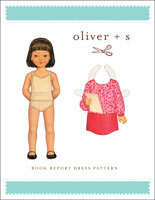 Discussion on the digital family reunion dress sewing pattern from the Oliver + S Discussion Forums. Find and share more photos on Instagram using the hashtags #familyreuniondress and #oliverands.